Flipping Favorites - So Fabulous! Words can't hardly describe how excited we were with everyone's generosity at this year's Fabulous Flipping Favorites this past May. Over 100 of you donated clothing. Over 20 of our vendors sent new clothing. Enough clothing was purchased (often in arm-loads) to raise over $5,500 for Rose Brooks Center. The following day, over 1,000 garments were transported to Rosie's Closet at Rose Brooks Center for the women sheltering there from domestic violence. Our customers are all Rock Stars and we can't thank YOU enough!! We Need Your Clothes!!! Well, Only Some of Them! Are You Ready for "Flipping Favorites"? Are you ready to FLIP IT? 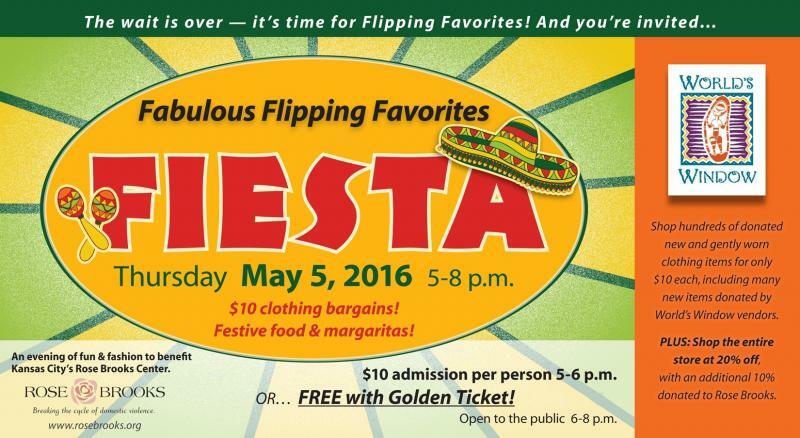 Our annual "Flipping Favorites" clothing benefit for Rose Brooks Center starts Saturday, April 9th. Read more about We Need Your Clothes!!! Well, Only Some of Them! Are You Ready for "Flipping Favorites"? 420 coats and sweaters on hangars and neatly folded in boxes. All delivered to Rose Brooks Center. All due to the generosity of our customers. You are amazing. You donated. You shopped. You partied. Because of you, women and children at Rose Brooks Center will be wrapped in warmth. Thank you!! We are enchanted with Dia de los Muertos and with all of the colorful, fun Day of the Dead folk art. Right in the middle of all that wonderful folk art, we've created a "remembrance wall" in World's Window.